If emergency towing is necessary, we recommend having it done by an authorized Kia dealer or a commercial tow-truck service. Proper lifting and towing procedures are necessary to prevent damage to the vehicle. State and local laws applicable to towing vehicles must be followed. 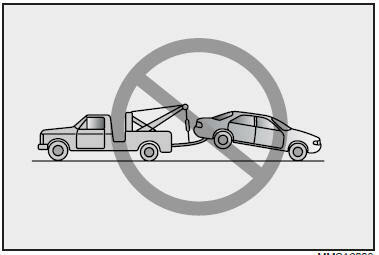 As a general rule, towed vehicles should be pulled with the driving wheels off the ground. If excessive damage or other conditions prevent towing the vehicle with the driving wheels of the ground, use wheel dollies. When being towed by a commercial tow truck and wheel dollies are not used, the front of the vehicle should be lifted, not the rear. 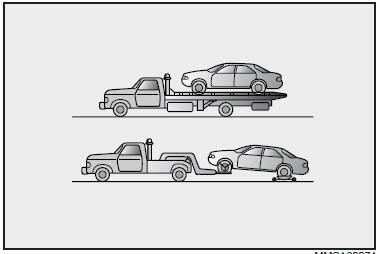 Do not tow the vehicle backwards with the front wheel on the ground as this may cause damage to the transaxle. Failure to place the transaxle shift lever in neutral may cause internal damage to the transaxle.